The infill system of the outer walls, their external finish and the footing of the covering is made with rigid expanded polyurethane with an average thickness of 28 cm applied with a spray technique in twelve separate coatings directly on the wooden panel. The polyurethane is obtained by mixing two components: polyol and isocyanate. The material used is “Dunapol S236 E” by Duna Corradini di Soliera - Soliera (MO) - Italy. 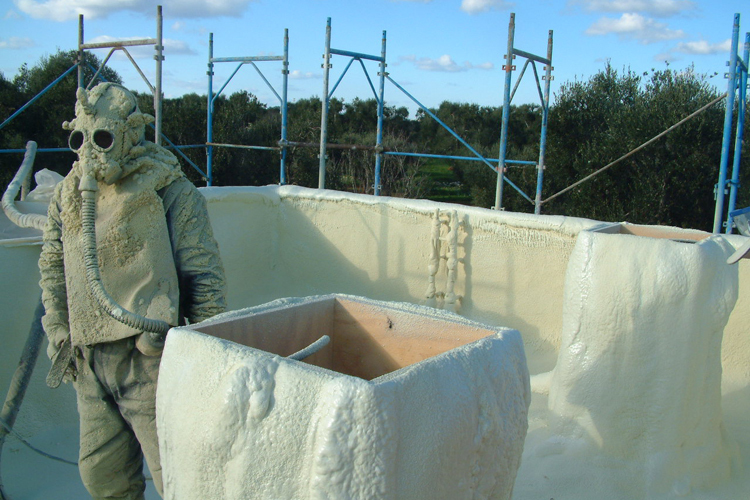 The external protection of the polyurethanic foam, which is necessary to protect it from ultraviolet rays and atmospheric factors, was also carried out with a spray technique (circa 1,2 kq/mq) of an acrylic elastomeric membrane produced by Jotun, pink NCS S0520-R and light-blue NCS S0520-R90B.